PGSM. Pet. マリリン Turtle. This is the turle that Motoki showed to Kamekichi in a photograph as Kamekichi's girlfriend. PGSM. Actress. 松下萌子 (まつした もえこ) The actress who played Kusaka Hina in the live action. She was born December 19, 1982 in Hyougoken Prefecture, Japan. Her agency is Oscar Promotion. She enjoys swimming and knitting. Moeco has released five CDs and one idol DVDs. PGSM. Attack. 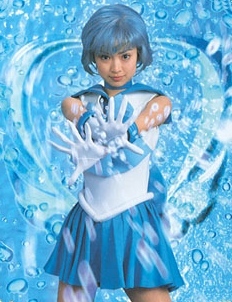 マーキャリー・アクア・ミスト Attack used by Sailormercury in the live-action. She forms the sign of Mercury from water and then shoots water at her enemy. First used in Act 2. PGSM. Transformation. マーキュリー・パワー・メイクアップ Transformation phrase used by Mizuno Ami to transform into Sailormecury. It first appears in Act 2 and is used throughout the show. PGSM. Item. イヤリング Earrings worn by Sailormercury in the live-action. The consist of three bubble shapped sections. PGSM. Item. けん Mercury uses this sword to fight against the enemy. She takes out her Sailor Star Tambourine and, calling on the power of water and the planet Mercury, she transforms it into a sword. First Used: Act 49. PGSM. Character. 水野亜美と The civilian form of Sailormercury. First appeared in Act 1. Ami appears to be shy, reserved, and cautious. At first, she has trouble making friends with Usagi and feels insecure about their relationship. However, she soon grows more comfortable and even becomes outgoing in her group of friends. She is very smart and a top student in school. She is always on time and turns in her work. She strives to be a doctor, like her mother. She does not have a good relationship with her mother, however, because they rarely see each other. PGSM. Item. ムーン　ライト　スティック. SailorLuna's wand that she uses for attacks. She is able to transform the wand into other items such as a harisen (fan) or a net. It is almost identical in looks to Sailormoon's Moonlight Stick. PGSM. Item. 月のペンダント Sailorluna wears this necklace human form around her neck. First Used: Act 27. PGSM. Actress. 森若香織 (もりわかかおり) The actress who played Tsukino Ikuko in the live action. She was born 12/11/1963 in Hokkaido, Japan. She sang in the musical groups the Go-Bang's and RamJamWorld, and acted in Cinderella Story (Theatre), "Lover Soul," and "Over the Century" in addition to TV, Radio, Music (solo), and stage appearances.